Are you looking for a generator that is more efficient and capable of starting higher loads? 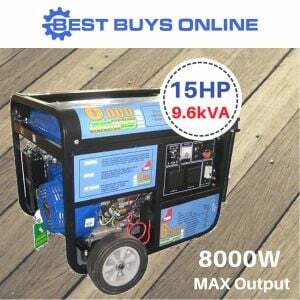 This super powerful Petrol Power Generator is your best solution whether you need a backup power supply to use in the event of an emergency power outage or occasionally use at home, farm or industrial base. Extremely durable and rugged, this generator is perfect for home/business backup, trade/construction applications, solar set up backup, events and much more. 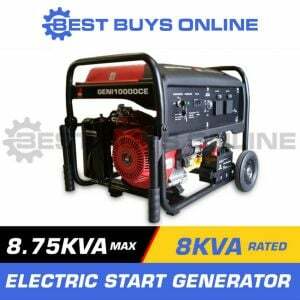 This Generator provides 12,000 watts of starting power and 10,000 watts of running power. It’s ideal for commercial use or as backup power for your home during emergencies. 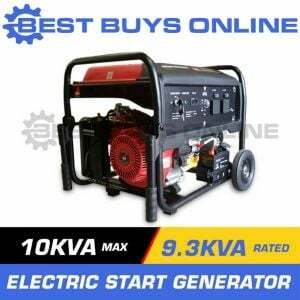 With easy electric start, this generator is engineered with commercial business and home power backup in mind. Geared for performance, this generator is combined with an efficient high output maintenance-free brushless alternator, which delivers maximums starting power. With super large 30 Litre heavy-duty fuel tank with built-in fuel gauge, it provides an average run time of 9 hours at 50% load and operates at about 97 dBA in 7 meters. The control panel conveniently provides easy, user-friendly access and visibility to the panel. Packaging Dimensions: 950 x 605 x 850cm, 198 kg.